At the end of September 2018, our leaders and leaders in the making travelled to Gdańsk for the third course week of the European Palliative Care Academy. The course week was conducted by the Nicolaus Copernicus University of Torun and Hospice Foundation and took place at the Fr. Dutkiewicz Hospice in Gdańsk. The focus of the Gdańsk week was on teamwork in palliative care and included aspects of how to build a team as a leader, and how to communicate effectively in that team. Support in the team to prevent burnout and challenges for interdisciplinary teams as well as challenges which arise with spirituality and interculturality were elaborated on during workshops and discussions. The participants also had their next sessions on Project Management, an ongoing module for continuous development where participants are supported and coached on their personal projects. Sessions were held by many experts in palliative care including Prof. Piotr Krakowiak and Dr Anna Janowicz from Poland (who were also responsible for the course week) and Prof. Raymond Voltz and Dr Christine Kuch from Germany. 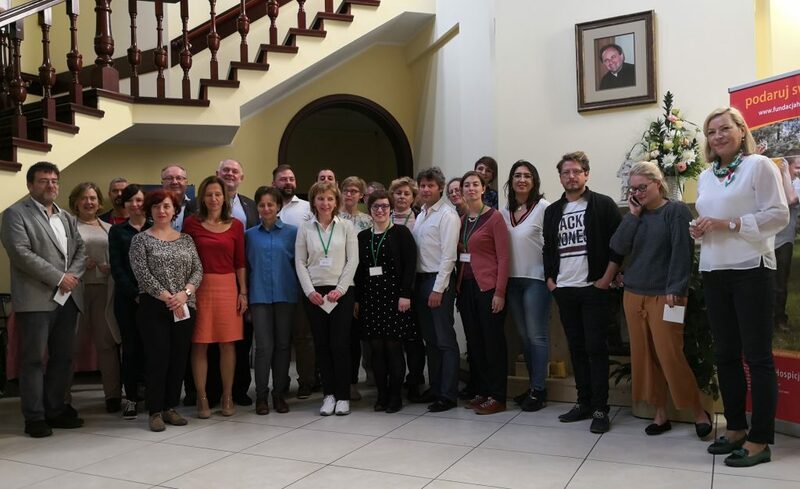 Prof. Piotr Krakowiak and Dr Anna Janowicz reported that participation of the group was very good and most of the lecturers were received very positively, with many vivid discussions and sharing. What was remarkable this time, that also after the classes discussions among students continued during breaks, after classes and even before them in the mornings. The EUPCA participants also had the chance to visit the Dutkiewicz Hospice as part of the Local Best Practice module, and hear about various promotional, fundraising and charitable activities of Hospice Foundation, being one of the leaders of palliative care in Poland. The Hospice celebrates 35th Anniversary, being the first home care hospice in Poland, so it was very special time for team from Gdansk. They shared their experiences in caring for adults and children at home and in inward hospice house, showing their cooperation with various groups of volunteers, helping in care, in funding and educating the community. After the long working days, the participants were tired but full of positive energy, inspirations, knowledge and skills. They have started the week with the visit of Old Town & City Center of Gdansk and toward the conclusion there was a time to celebrate unity in diversity in occasion of the birthday of one of the student with songs of Happy Birthday in 15 different languages during our Gala Dinner. Students motivated by the teamwork exercises were having great ideas regarding possible future cooperation in the Alumni Association of EUPCA, which they shared with Prof. Raymond Voltz and Prof. Piotr Krakowiak. They were received with attention and asked to present their proposal for Alumni to the Steering Committee of EUPCA. We look back on a successful week and would like to thank all participants, lecturers and others involved! We hope to meet all of you together in Brasov and to hear your stories at the end of the course.